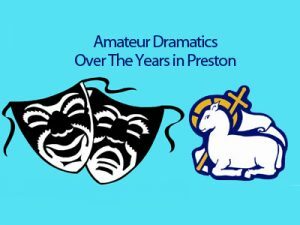 Were you aware of the number of Amateur Drama Groups there are in and around Preston? In my estimation there are about a dozen or so, but rather more if I include Gilbert and Sullivan Societies, Opera Groups, Musical Comedy Societies and Orchestras. There are also numerous groups around Chorley, Leyland, Lytham, St Annes and Blackpool. All of these are thriving and popular. Amateur Drama Groups form an important role within the local community, both for those actively involved and for the audience they entertain. Preston has a long history of Theatre and Stage, both Professional and Amateur. The first reference to theatre in Preston was apparently as early as 1688, during the Civil War. But it was during the Victorian and Edwardian era that the theatres came to prominence. Many Theatres and Music Halls opened in Preston to accommodate a fast expanding population who demanded being ‘entertained’. Preston became an increasingly important town on the Entertainment Map. You would need to be a certain age to remember The Public Hall, The Theatre Royal, The Prince’s Theatre, King’s Palace Theatre, The Empire and The Hippodrome all popular till the early fifties. Each had its place in Preston’s Theatre History. Perhaps the best remembered for plays is the Hippodrome which was on Friargate and became home to the Reginald Salberg Players in 1947. Reginald Salberg reflected that “there was a need in Preston for a theatre which will concern itself for a large part of the year with good plays, well presented”. It must have been successful as his Players stayed for approximately eight years. The weekly plays became a feature of the town’s culture. Many of its starring actors became household names of the London Stage and of screen. Do you remember any of these ?…. Peggy Mount – numerous stage, film and TV roles ‘George and the Dragon’. John Barren – Numerous TV sit coms, ‘Yes Minister!’, ‘Rise and Fall of Reggie Perrin’. Derek Benfield – playwright, ‘Hettie Wainthrop’. John Dearth – West End stage and Dr Who. Frederick Jaegar – West End Stage, TV roles. Leonard Rossiter – ‘Rising Damp’, ‘Rise and Fall of Reggie Perrin’ and That Advert for Martini with Joan Collins!. After the televising of the Queen’s Coronation in 1953, the popularity of television brought about the demise of many local theatres and in 1955 the Hippodrome curtain too was lowered for the last time and the actors took their final bow. The building, which had echoed to the applause of hundreds of Prestonians and where so many stars had made their acting debuts, was demolished to resurrect as C&A Modes Fashion Department Store. That too was later demolished to make way for the Ring Road passing right through the centre of town. Preston born and bred, Roy Barraclough was regularly in the audience of The Salberg Players which gave him the incentive to follow in their footsteps and become an actor. He joined Preston Drama Club, thence became a professional actor appearing regularly on TV, famously in ‘Coronation Street’, and with Les Dawson in their ‘Cissie and Ada’ sketches. Historically numerous churches around Preston also had their own Drama or Musical or Choral Group. Sadly these too have folded. They provided the social event of the week …the ‘Facebook’ of their era – boy meets girl. Many a romance started during these weekly rehearsals of plays and musicals. In 1973 the Guild Hall Complex and Charter Theatre opened their doors. Richard Todd opened the season at the Charter Theatre in ‘Murder By Numbers’….I know I was in the audience on the front row! In the intervening years many stars of stage and screen have trodden the boards of the Charter Theatre. It is now home to several Operatic Groups and to Preston Musical Comedy. Many members of local drama groups have acted on that stage for the brilliant Charity Players who performed for many years raising money for St Catherine’s Hospice. The Guild Hall is used for local Dance School Shows and the Annual Schools Music Festival. The numerous current and lively Drama Societies rely entirely on volunteers. It takes a small army to put on a performance. The Set Builder designs and builds the brilliant, realistic and often complicated sets. The Wardrobe Mistress provides the appropriate costumes be they modern or historically correct. The Props Manager provides the on stage requirements for each member of the cast. The Prompt, ‘on the book’ assists the actors should they forget a cue line. The Stage Manager is in charge of the whole production for each performance. The Box Office Manager runs the ticket sales prior to and at each performance. The Refreshment Team provide tea or coffee at the intervals of the play, or staffs the bar. The actors learn their lines and moves, rehearse and perform guided by the firm but friendly Director. The audience is of course paramount. What would be the point of all the concentrated effort of rehearsal lasting weeks or even months, if the actors are performing to an empty stage? So, we seek your support for Amateur Groups of all genres. We who are involved love our hobby. It is wonderfully fulfilling. Come along to a performance, You will be brilliantly entertained by enthusiastic people, to live theatre, or song, or dance at a fraction of the cost of the London prices and be following a historical tradition.